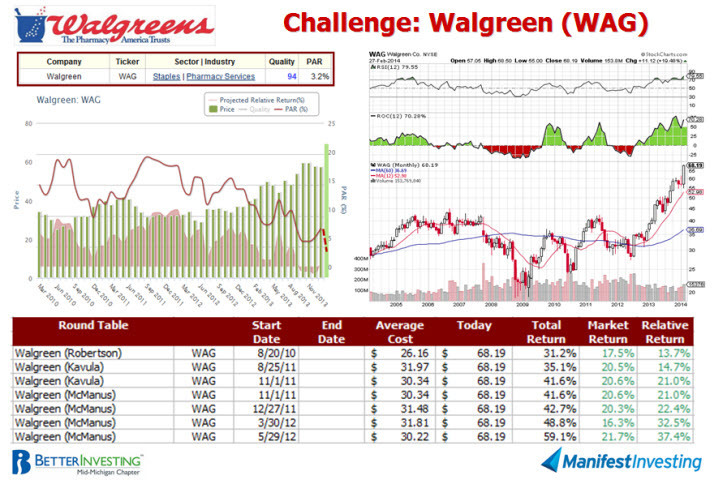 Walgreen (WAG) will likely be suggested as a sell candidate during the February Round Table. The recent surge in stock price ($68) results in a return forecast of approximately 3%. The August-2010 selection was the first Best Selection winner at the first red carpet gala. WAG has been selected by three of us, with the four most recent selections by Hugh McManus. The stock is overbought with a relative strength index (RSI) of 79.6 and momentum (ROC) is considerable as the stock price has advanced 70.3% over the trailing 12-months. This is an excellent company — and it has been very, very good to us. Our $7000 invested in Walgreen in the Round Table tracking portfolio is now worth $15,801. Closing out these positions will lock down 7-of-the-top-20 all-time results for our Round Table since inception. What is your outlook on Walgreen? Would you sell? Would you consider covered calls for an exit strategy?